As Singapore works towards a more efficient public transport service the challenge is to meet the needs of a rapidly increasing population that is making demands on the system. While various measures have been put into place to ease the strain on the system by the incumbents, third-party players have found an opportunity to make their presence more than felt. In the taxi industry, companies developing booking apps have been aggressively introducing innovative features and marketing techniques to entice passengers and drivers alike to seriously flag their offerings. In 2014, the ComfortDelGro group logged a record 35.6 million bookings, half of which were made using their taxi booking app. While the group is still operating profitably, having made a 7% increase in revenue through taxi operations in Singapore alone, third-party apps are hoping for a share of the action with their aggressive marketing and innovative feature set. When third-party taxi booking apps arrived in Singapore, they gained a following by addressing an issue with the existing booking system. Using the GPS feature on the smartphone they were able to match customers with taxis that were nearby. The independent taxi apps were quick to hitch a ride on this opportunity, with Grabtaxi, Easy Taxi and Hailo joining the ranks of apps. Given the available options, taxi booking apps have to market to two distinct groups — passengers and drivers. Passengers favour convenience, reliability and attractive offers while for drivers, it is the promise of a profitable partnership. Katie Boon, 22, has been using GrabTaxi since it came to Singapore. “I really like GrabTaxi because it saves me the trouble of making a phone call and being put on hold for five minutes or more. I also manage to get a cab with the app almost all the time,” she says. A GrabTaxi spokesperson attributes its popularity with passengers to providing market specific solutions. “In Malaysia and Philippines, our focus has been on addressing the safety concerns of commuting via public transport, whilst in Singapore our focus has been on speed and efficiency to provide our users with a confirmed taxi ride as fast as possible. Because we’ve tailored the way we do business and truly understand each market, we’ve been able to resonate well with our customers and this has led to us being the top taxi booking app in the region” she says. In this day and age of speed, prompt service and limited patience, efficiency often trumps loyalty to any app. “The few times GrabTaxi fails to get me a taxi, I’ll try my luck with Easy Taxi or ComfortDelGro’s own app. When I really need a cab I’m not going to bother with loyalty to one app or the other,” adds Boon. Some apps like Hailo offer cashless payment options that they handle, and allow users to save their credit card details on the phone. This makes it convenient, especially since not all cabs can take credit card payments. “Most taxis accept cards but I end up drawing money anyway just in case I get a cab with a driver who claims the NETS machine is not working. Which defeats the purpose of cashless transactions. 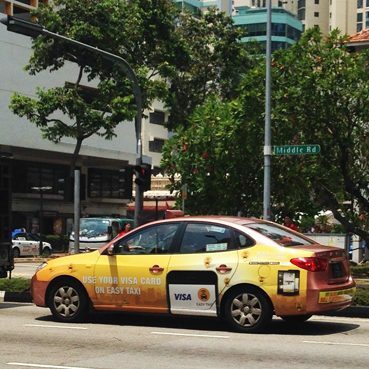 Apps like Hailo solve this problem by allowing you to pay through your phone,” says Jehanne Teo, 25. In addition to technical innovations, attractive offers and promotions are factors in attracting customers to an app. “Singapore consumers are very sophisticated and practical, so good discounts and partnership deals are always factored in,” says Jianggan Li, Managing Director of Easy Taxi. Another factor that is easy to overlook is an app’s popularity with the taxi drivers themselves. Apps like Easy Taxi offer several incentives to attract drivers to their service. “Currently we have target based incentives on a weekly basis. If the driver hits a certain number of rides he will get a cash reward. We also run lucky draws and give out gifts to drivers based on specific targets,” says Li. One of the more innovative incentives is the GrabTaxi Provident Fund (GPF), a S$3.5 million welfare fund for drivers who meet the monthly service and usage criteria. Each qualifying drivers will receive $300 in his GPF. The funds can be used for accident coverage, medical costs as well as crisis support. Like its competitors, GrabTaxi also offers incentives for drivers who hit a weekly quota. Like passengers, drivers take into account how cashless transactions are handled. While customers value convenience, drivers place value on how fast transactions are debited. Tan, 34, a taxi driver, uses both GrabTaxi and Hailo. “I like GrabTaxi because it uses DBS PayLah! which allows us to get cashless payments credited instantly, which is important for taxi drivers with tight finances. “With Hailo, most of the rides are paid through cashless transactions. While not instant like DBS PayLah!, they promise that the transaction will be credited by the next working day. The cashless system benefits both drivers and passengers as the drivers get their cash faster than with the standard credit card transactions and the passengers often prefer to pay without cash,” he adds. The taxi app providers charge a fee for their service, as do the taxi companies. Bookings made through ComfortDelGro incur a 30- to 40-cent fee. GrabTaxi and Easy Taxi ask for 30 cents per booking while Hailo requires 50 cents. Cabbies don’t mind paying the fees as they make it easy for them to get passengers and reduce the time wasted cruising empty. These apps are in the unique position to throw a spanner in the works of big players like ComfortDelGro. “For large operators such as Comfort, which make profit from bookings, our app gives them the imperative to improve their system and booking experience,” explains Li. According to GrabTaxi’s spokesperson, the company grows by double-digit figures every month. “To provide perspective, we currently do more rides a day than we did for the whole month of January 2014.” No figures were forthcoming from GrabTaxi. While ComfortDelGro may be a market leader now, the rapid growth of third-party taxi booking apps should force them to work hard at holding on to their advantage. Esports Singapore — Game ON!